Zhong Kui was one of the most popular mythological subjects in China. According to legend, he appeared to the Tang Emperor Minghuang in a dream, promising to protect the Emperor from demons. Upon successfully exorcizing the demons, the Emperor ordered the famous painter, Wu Daozi, to paint his dream, and had the image of the demon-queller reproduced and distributed all over the realm to ward off evil spirits. It is this image of Zhong Kui bearing his sword that is seen on many works of art, but rarely found on snuff bottles. See another iron-red-decorated porcelain example in the collection of the Marquess of Exeter, illustrated by Hugh Moss, Chinese Snuff Bottles No. 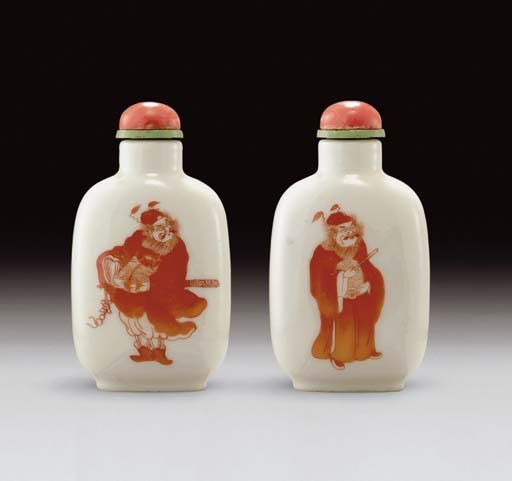 6, p. 31, C. 11, which bears a very similar depiction of Zhong Kui; and a second example illustrated in The Au Hang Collection of Chinese Snuff Bottles, p. 202-3, no. 273.